There's no calm after the storm when Season 4 of Fear the Walking Dead - the companion series to the #1-rated cable series "The Walking Dead" - arrives on Blu-ray™ (plus Digital) and DVD March 5 from Lionsgate. 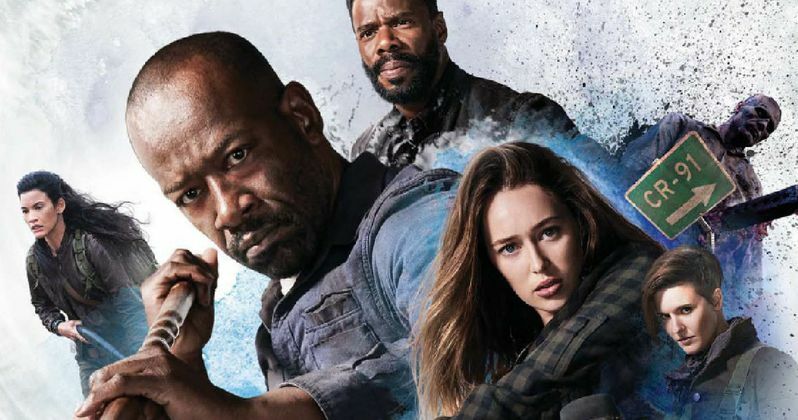 Morgan Jones crosses over into unknown territory as the worlds of The Walking Dead and Fear the Walking Dead collide in what has been hailed as "absolute must-watch television" by ComicBook.com. Fear the Walking Dead Season 4 stars Lennie James (TV's The Walking Dead and Save Me), Alycia Debnam-Carey (TV's The 100, Friend Request, Into the Storm), Kim Dickens (Miss Peregrine's Home for Peculiar Children, Gone Girl), Frank Dillane (TV's Sense8, In the Heart of the Sea, Harry Potter and the Half-Blood Prince), Colman Domingo (Selma, Lincoln), Danay Garcia (TV's Prison Break), and new season regulars Maggie Grace (Taken, The Hurricane Heist), Garret Dillahunt (12 Years a Slave, No Country for Old Men), and Jenna Elfman (TV's Dharma & Greg, Friends with Benefits). In Season 4 of Fear the Walking Dead we will see the world of Madison Clark (Dickens) and her family through new eyes - the eyes of Morgan Jones (James), who is joining the story from the world of The Walking Dead. The characters' immediate pasts mix with an uncertain present of struggle and discovery as they meet new friends, foes, and threats. They fight for each other, against each other, and against a legion of the dead, and work to build an existence strong enough to resist the crushing pressure of lives coming apart. There will be darkness and light; terror and grace; and the heroic, mercenary, and craven, all crashing together toward a new reality for Fear the Walking Dead. The home entertainment release of Fear the Walking Dead Season 4 includes four different audio commentaries with cast and crew, providing an in-depth, personal account of how episodes 401, 405, 410, and 416 were made. The Fear the Walking Dead Season 4 Blu-ray and DVD will be available for the suggested retail price of $44.99 and $39.98, respectively. Produced by AMC Studios, Fear the Walking Dead is executive produced by Scott M. Gimple, showrunners Andrew Chambliss and Ian Goldberg, and Robert Kirkman, David Alpert, Gale Anne Hurd and Greg Nicotero.